Young Money: Will tight monetary policy and loose fiscal policy push the dollar higher? Will tight monetary policy and loose fiscal policy push the dollar higher? I recently read Jack Schwager's trader-interview book The New Market Wizards, which includes an interview with Stanley Druckenmiller. Many people consider Druckenmiller one of the best investors alive, and he lives up to his reputation in the interview, sharing a number of fascinating anecdotes and ideas. I never had more conviction about any trade than I did about the long side of the Deutsche mark when the Berlin Wall came down. One of the reasons I was so bullish on the Deutsche mark was a radical currency theory proposed by George Soros in his book, The Alchemy of Finance. His theory was that if a huge deficit were accompanied by an expansionary fiscal policy and tight monetary policy, the country's currency would actually rise. The dollar provided a perfect test case in the 1981-84 period. At the time, the general consensus was that the dollar would decline because of the huge budget deficit. However, because money was attracted into the country by a tight monetary policy, the dollar actually went sharply higher. When the Berlin Wall came down, it was one of those situations that I could see as clear as day. West Germany was about to run up a huge budget deficit to finance the rebuilding of East Germany. At the same time, the Bundesbank was not going to tolerate any inflation. I went headlong into the Deutsche mark. It turned out to be a terrific trade. Today the United States has a similar combination of tight monetary policy and loose fiscal policy. The Federal Reserve has begun raising interest rates and shrinking its balance sheet ahead of its European and Japanese counterparts, while the US fiscal deficit is set to surge following a large corporate tax cut. • The dollar is already relatively high. • Anecdotally, sentiment is also high. The consensus of Wall Street currency strategists seems to be that, since the US growth has accelerated at the same time that economic data have surprised to the downside in many other countries, the dollar can only continue to rise for the foreseeable future. • The U.S. current account and NIIP are weak. In the late 1970s and early 1980s, the U.S. ran trade deficits that were relatively small by today's standards, and it had a strong net international investment position. Germany's trade surplus steadily grew throughout the 1980s. Simply, the U.S. has less wherewithal to run government deficits without incurring major risks. 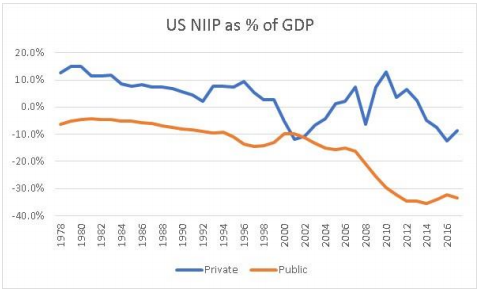 Also, my hunch—and I'll reiterate here that I'm not a macro expert, so this may be completely wrong—is that the NIIP plays a major role in determining whether deficits are good or bad for a currency. Most investors have a home-country bias, i.e. they prefer to invest domestically so long as domestic investments have a competitive risk/reward. So if a country increases its supply of government securities (expansionary fiscal policy) and also guarantees that those securities earn high returns (tight monetary policy), and its citizens own significant foreign assets (a positive NIIP), some of them will sell those foreign assets to buy the newly-created domestic securities, which will push the country's currency higher. Whereas if its citizens have significant international debts (a negative NIIP), this dynamic isn't possible. • The “return on deficit” will be lower. In the early 1980s, the U.S. experienced two recessions that kept its economy below potential. In 1989, Germany had a significant identifiable need for investment in the form of integrating East Germany. By contrast, today the U.S. is nine years into an economic recovery, the unemployment rate is low, and there are many anecdotal signs of labor shortages. An economy with minimal spare capacity and full employment will be less responsive to fiscal stimulus than one that with significant spare capacity and unemployment, so I would expect the current US deficit to be far less stimulative than the two deficits Druckenmiller mentions. And even before the tax cut, the U.S. government was running large deficits in the midst of a long economic expansion. This suggests that a large part of the deficit is structural, so rather than being economically beneficial it's a sign of weakness.